WIRE MESH WITH RAW EDGE: This term "Raw Edge" refers to edging that is not continuously woven and is usually the result of manufacturing wire mesh on a Rapier Loom. In this case, the shute wires are uncovered or raw. Raw Edge is the predominant edge type of industry, particularly on a finer mesh (usually 20 x 20 mesh or finer). Further raw edge often preferred when customers are looking to keep their costs down. Wire Mesh: Product Details: Mesh Size(per inch) 0-10 , 10-50, 50-100 , 100-150 Surface Finish Coating Black Polyester , Black Powder Weave Type Hexagonal, Twill International Wire netting Industries are the leading Manufacturer & Exporter of Wire Mesh (Jali) from Coarse to Fine Apertures of Sieving & Screening. It can be made in fine apertures upto 600 Mesh, while upto a Maximum Wire Thickness of 16 MM made up of Stainless Steel, Spring Steel, Mild Steel, etc., as per the Customer's Sizes and specifications. The Wire Mesh is manufactured as Per the BIS, BSS, ASTM, TYLER & DIN Norms & Standards. They are widely used in Chemical, Stone Crusher, Fertilizers, Sugar, Pharmaceuticals, Steel, Food Processing, Cement, Mineral, Construction, etc. We Maintain READY STOCK of Stainless Steel Wire Mesh upto 2500 MM Wide! 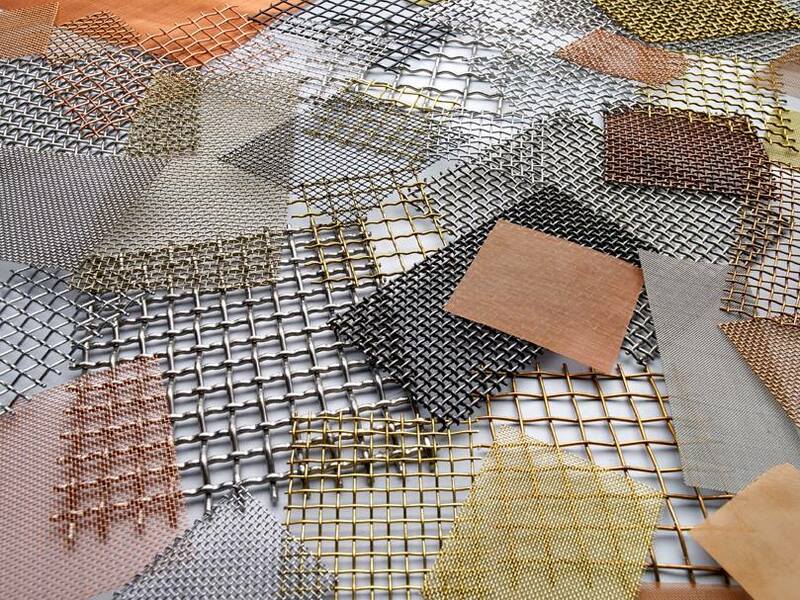 SQUARE MESH: Manufactured in Galvanized Iron, Stainless Steel, Brass, Copper as per ISI/BSS/ASTM with finest microns and meshes, Dutch Twilled Weaves also available. STAINLESS STEEL PRINTING SCREEN: This is a kind of ultra-thin woven stainless steel wire mesh with uniform opening and good firmness. The uses of carefully selected special stainless alloy materials and the most advanced weaving technology adopted ensure the very compact weaving structure is achieved and the thickness of the wire mesh is within the allowed tolerance range. Hence the precision of the wire mesh is further enhanced for high precision printing requirements. Materials: SS 304, SS304 L, SS 316, SS 316L Features: This wire mesh is formed from stainless steel offering good wear resistance, high strength and less technical extension. The fine wire diameter allows good ink performance, also the wire mesh screen has stable mechanical properties, chemical properties and accurate sizes. The shortcoming of stainless steel printing screen is its lack of flexibility and more expensive price. Also, the wire mesh cannot restore properly to its original forms after expansion. Applications: It is used in printing of electronics, textiles, ceramics, glass and other industries, also used as filter media in aviation, aerospace, petrochemical, and other high-tech areas. Microbic Wire Cloth: 1) Features: Optimum flow rates, Narrow pore size distribution, Precise alignment of filter pores, Stability, Rigidity, Excellent resistance to abrasion, No particle dissolution, Easy to clean, Excellent levels of plasticity, Chemical and thermal resistance, Smooth surface structure, High levels of reliability. 2) Uses: Pressure filters for fine filtration in hydraulic steering equipment, Oil and fuel filters, Pressure and vacuum filters, As porous media for fluid beds, Filter candles, Medical science, Food and beverage industry, Plastics industry. 3) Properties: Accuracy of weave, Regularity, High stability, Rigidity, Corrosion resistance, Thermal resistance, Resistance to moisture, No static loading, Ease of fabrication. S S Wire Mesh : Product Details: Minimum Order Quantity 50 Square Feet Mesh Size(per inch) 0-10 , 10-50, 50-100 , 100-150 , 150-200 , 200-600 Material SS304, SS316, Fine SS, Coarse SS, Stainless Steel Wire Gauge (mm) According to mesh Weave Type PSW, Twill, Dutch weave Type Wire mesh Material Stainless Steel Thickness DEPENDS ON MESH Brand UWP Usage Industrial, Agricultural, Domestic , etc. The S S Wire Mesh is precisely manufactured by utilizing quality tested stainless steel and leading technology under the proper guidance of our adroit technocrats in adherence to set industry standards. WIRE MESH CONVEYOR BELTS- 1) COMPOUND BALANCED BELTS: These belts are used as baking bands. It has also employed for unstable items that require very flat surfaces and product support. We manufacture and supply compound balanced belts in which right and left spirals are closely fitted with smooth and dense weave rendering it with a great system for conveying very fine or small products as well as unbalanced or unequal items. The connector is crimped on the more open meshes and straight on the closed meshes. Our belts have several usages in several industries across the country. This belt can be selected for medium or high temperature applications where.